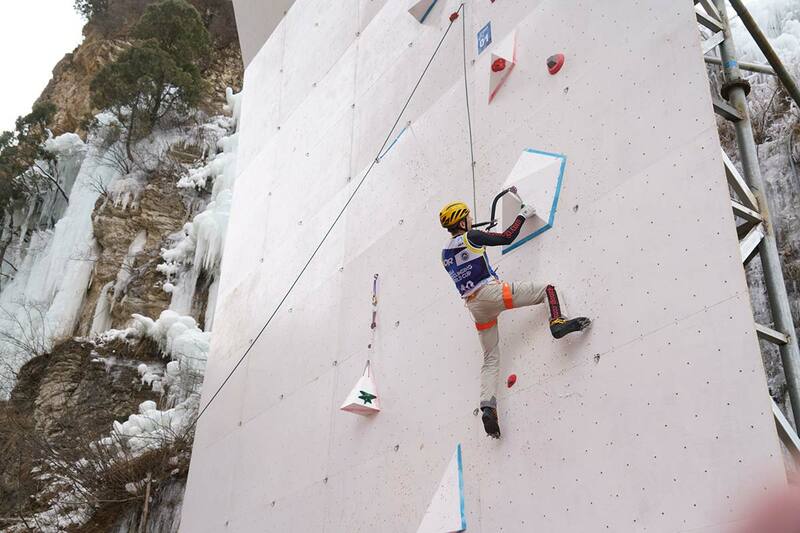 The second round of the 2019 UIAA Ice Climbing World Cup season concluded earlier today in Beijing. Hosts for a second time, the capital of China witnessed a memorable event which saw some new names mount the medals podium and confirmed the supremacy of two Russian athletes. In the lead competition, athletes from seven different countries made the finals. Russia’s Maria Tolokonina and Nikolai Kuzolvev maintained their outstanding form to claim the gold medals. After winning December’s Combined World Championships in Moscow, the two athletes also triumphed in the World Cup season opener in Cheongsong last weekend. Quite a start to the season. Perhaps the bigger story was the identity of the other athletes to podium. In his first ever Finals, France’s Nathan Clair took silver. Indeed he lead the Finals until Kuzovlev with a score of 17.322 took gold with the final climb of the weekend. South Korea’s Lee Younggeon for the second weekend running won bronze. No athlete topped the steep and overhanging structure of Beijing. One of the biggest surprises in the men’s finals was HeeYong Park’s costly slip just seconds into his climb. Like Kuzovlev, Tolokonina having performed best in the semi-finals was the last climber in the women’s competition. There were few nerves nor fatigue after the morning’s speed competition. A mesmeric and confident performance saw her claim gold in style. Ireland’s Eimir McSwiggan – longtime leader in the competition – claimed a historic silver medal with Enni Bertling in third winning a first ever lead UIAA Ice Climbing World Cup medal for Finland. The three-dimensional nature of the Beijing ice wall demanded significant strength, power and route finding from the athletes. Here, Tolokonina had to settle for bronze with Ekaterina Koshcheeva (19.78) winning the final duel with Ekaterina Feoktistova (22.01) to claim gold. The men’s speed competition was claimed by Vladislav Iurlov (16.18) who defeated reigning World Champion Vladimir Kartashev (16.75). Defeating last weekend’s gold medal winner Anton Nemov, ensured Anton Sukharev a bronze medal. In two World Cup events, four different athletes have claimed gold medals. The 2019 UIAA Ice Climbing World Tour is partnered by Outdoor Research. Photos from the Beijing World Cup can be found here. The next round of the UIAA Ice Climbing World Cup takes place in Saas-Fee, Switzerland next weekend, 24-26 January.